“You can call me Academy Award Winning Leo D,” he breathed in her ear. Okay okay, it’s probably unlikely these are the words Leonardo DiCaprio uttered unto Rihanna in the above photo — but only because they already know each other! 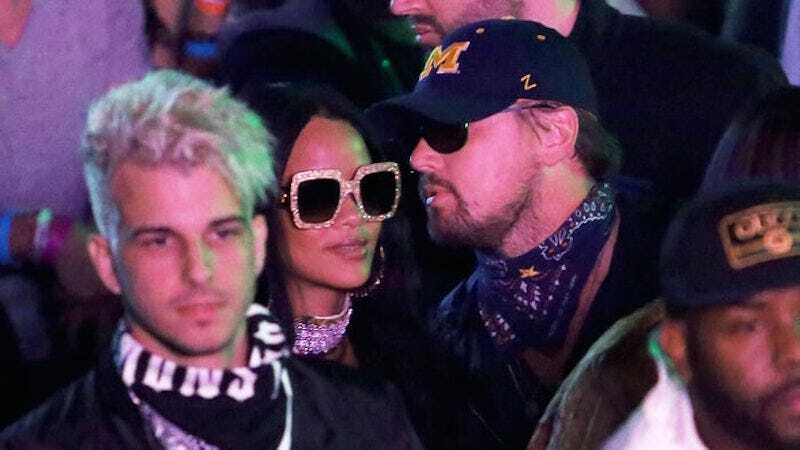 In any case, a bandeau-ed Leo and a characteristically luminous Rih were spotted chilling at Coachella. New York reports that the “former maybe-lovers” took in the Neon Carnival together (the ostensible reason for the photo’s pinkish glow). Still, there’s no substantive evidence that the two are headed the way of romance. Tabloids are busy sussing out which Victoria’s Secret model Leo is courting post-Oscars—there are rumors that he’s seeing Chelsey Weimar—and Rihanna by all accounts is unattached. And so much the better. Truly, what degree of hubris would be necessary to consider oneself a match for Rihanna? If we’re lucky, however, this photograph might inspire a new, deeply melancholy Drake album.